Shannon's Studio: Free-for-All Friday Exchange, Let's Trade! Free-for-All Friday Exchange, Let's Trade! This is a study I did a little while ago. Lunch 11" x 18" My kids are always coming home and telling me what they got and traded at lunch time. They seem to enjoy this little bartering system. They are always pleased and satisfied with the exchange. For Free-for-All Friday I want to do what kids do all the time at lunch. Exchange. I want to trade this painting for something you might want to trade with me. Put in the comments what you are willing to trade. It doesn't have to be 'equal' value. Be creative. I'll consider all trades until tomorrow night around 6 PM (CST) then post who I'm exchanging with. Let's trade! I will trade 1 Rhode Island Red Rooster and 2 Araucana Hens. The hens lay greenish blue eggs, and the rooster, well he does rooster stuff like crowing and making little chickens. Try and beat that! Great comment Allen! I don't think I have anything as cool to trade! Uh....I got nothing. I think Allen wants a Rooster and some hens, that's a total old school trade! That's awesome! Dacia could trade you a really cute apron, but the cost value isn't the same. Love ya Dosh! I'll let you pick me up from the airport in May. Good trade or what?! All I have to trade is a little humor. Try my podcast and see if we can strike a deal. Well, which reader could not at least try to bid? Although my trade comes with strings attached. I have not yet finished making the item I am using to bid, and will not ship it until I have finished. On to the item; in my spare time I am making a little side table. I have cut the wood, leveled, stripped, sanded, stained, and sealed it. I have left to glaze and add the pegs so the glass will sit level. I have added images of the conceptions though the current state. I can totally understand you choosing someone else as I of late have been on the receiving end of your talents. 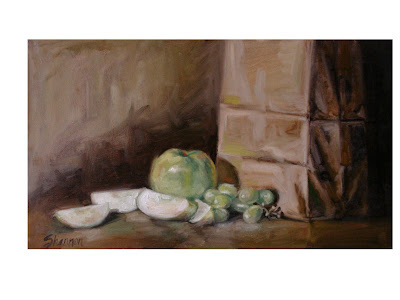 I do also think this is a great type of post so I know in time I again will have the option to bid again on a painting. I will trade you poached eggs, rolls, and the moving of the corral. or a batch of cookies. Ok, I looked at the site and there are TONS of watches. All cute. I have no idea which one so you better link a pic. I'll think of my trade later. My Chicken Soup for the Soul promotion package. I used it to capture sponsors at an event Jack Canfield was speaking at. It's the large number 10 can with a look-alike Cambell's Soup can label with goodies inside. I will offer you a date with your husband: a link that you can share with him over Webcam to recent talk online by Jeffery R Holland. It spoke of looking forward in a realtionship and knowing how to use avoid looking back. The download is free and it's instant delivery :-) You make a date and time with your husband (maybe Valentines Day!). Meet on Webcam and click on the link. I will include in the link a quiz you can take just for the fun of it. But you can't cheat and look at the questions ahead of each other. I'll be your date to the Kansas City Art Auction in February. Though I still might go with those chickens if I were you.